« Eat Pizza -> Support Groundwork! Join us for Sap on Tap at Aeronaut Brewing Co. where we will enjoy a specialty brew and brunch! Taste local syrup, delicious waffles, brews and learn about the maple sugaring we do right here in Somerville. Aeronaut’s limited edition is brewed with real maple sap collected right here in Somerville. Groundwork Somerville and our volunteers have been collecting sap and making maple syrup in Somerville for over a decade. We are continuing the tradition of partnering with Aeronaut Brewing Co. to bring you locally sourced maple beer! 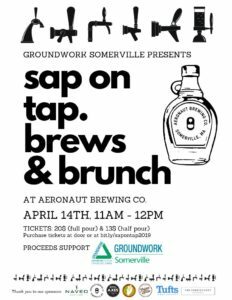 Proceeds will be donated to Groundwork Somerville to support the Maple Syrup Education Project which teaches 2nd graders across the city about tapping trees and boiling down sap. Learn more about Groundwork Somerville by following us on Facebook and Instagram or at groundworksomerville.org. Your ticket purchase gets you entry to this event, steaming waffles with maple syrup, and either a sample sized or full pour of the limited edition brew from Aeronaut Brewing Co. Please purchase tickets on Eventbrite in advance. A limited number of tickets will also be sold at the door. Tickets at bit.ly/sapontap2019. Aeronaut welcomes folks under the age of 21 with the presence of a parent or legal guardian. Please note that no outside alcohol is permitted on site.